Maya Kodnani at the event on Sunday. 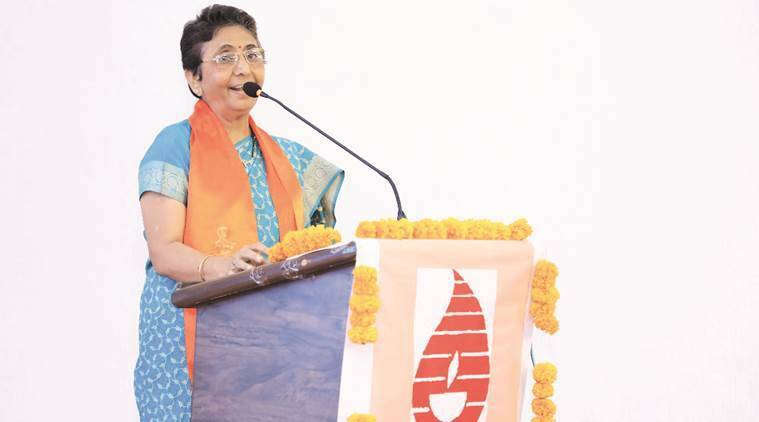 Former BJP minister Maya Kodnani, who was recently acquitted in the 2002 Naroda Patiya massacre case, on Sunday urged the Sindhi community to unite, saying “in today’s time, the god is sangh (organisation).” She, however, clarified that by sangh she did not mean the Rashtriya Swayamsevak Sangh (RSS). Addressing a gathering of Sindhi community at Adalaj in Gandhinagar Kodnani said, “Sanghe shakti Kalyuge, meaning that god is in organisation (sangh)… In today’s time, organisation is god. Kalyug me bhagwan koi vyakti nahe…kalyug me bhagwan sangh aahe (In Kalyug, a person will not be a god, but the god will be in sangh)”. She, however, immediately clarified in lighter vein that “sangh here doesn’t mean Rashtriya Swayamsevak Sangh (RSS), but the power of sangh is god”. Kodnani, who is also from Sindhi community, is undergoing trial in the Naroda Gam killings case of 2002 post-Godhra riots. She said that events like this has a purpose of strengthening Sindhi organisation. “In Gita, Krishna has said that he will save the dharma, but in Kalyug (today’s time), sangathan will do it,” she added. Kodnani said that “societies that are united are sajjan (good)”, adding that the purpose of “sangh” is to unite societies for the betterment of people. She said “sangh” should be powerful but not muscular like Bollywood actors “Salman Khan or Akshay Kumar”. The event was organised by Bhartiya Sindhu Sabha and was attended by its president Lagharam Nagwani, Naroda MLA Balram Thawani, Secretary in the Social Justice and Welfare Department of Gujarat government Kamal Dayani among others. Kodnani was acquitted by the Gujarat High Court in April this year in the Naroda Patiya massacre case in which she was found guilty by the trial court and was sentenced to life imprisonment along with 31 others for the killing of 97 Muslims during the post-Godhra riots.